Zolo Grill has offered Tequila 101 a few times over the years, and Saturday’s tasting included a blanco (silver), reposado, and añejo from Corzo. Corzo–if you are drawn to a unique label or bottle when eyeing booze–is the one in the tall rectangular bottle, topped with an off-center spout that pours like a fountain in Mexico City (true: the bottle was created by Fabien Baron, a designer notable for his fragrance bottles, and was inspired by the sculpture Fuente de los Amantes by Mexican modernist architect Luis Barragán). So, yes, Corzo is top shelf stuff, but the tasting at Zolo was fun and festive and friendly, kind of like how I feel when I drink tequila. Chips and addictive guac helped us get in the mood as people were arriving for the tasting, which was held in Zolo’s heated and enclosed party space. As the snow fell in earnest, we imagined the highlands of Jalisco, where jimadores harvested agave piña and used tahonas to prepare it for roasting. 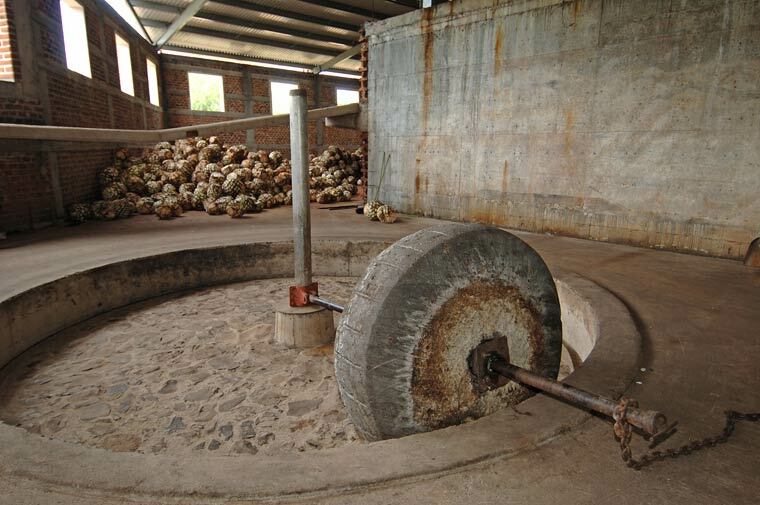 Our hosts circulated some photos of both the old-school and modern methods for making tequila to help us picture the process. Not a whole lot has changed–save for stainless steel replacing the stone tahona–and a good tequila still captures the essence of where the agave grew: terroir applies to tequila, too. We were served pours of each of Corzo’s tequilas–blanco, reposado, and añejo–and encouraged to taste at our own pace while our hosts Brian and Nick explained the characteristics of each. 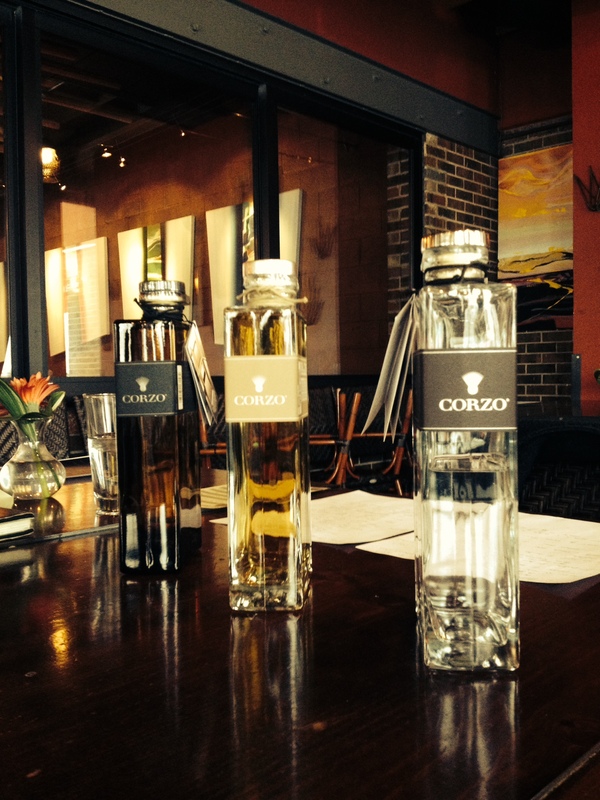 Since Corzo was the featured brand, we focused on its flavor profile, but talked about tequila in general, too. As a rule, a blanco tequila goes straight to the bottle after distillation , a reposado must age for a minimum of two months (up to a year), and an añejo can sit in French oak for 12-36 months. Corzo’s blanco, for example, takes advantage of a law that says a blanco can “rest” for up to 60 days in an oak barrel and spends two weeks mellowing out in American white oak before its third distillation (also unique to Corzo tequilas). With the help of our guides, we were able nudge our noses to identify aromas like orange and vanilla, while our tastebuds found pineapple, banana, and cinnamon. With the increasing age of each tequila, we found increasing depth of flavor. In my opinion, tequila is a sipping spirit, and a blanco deserves as much of your time as an añejo. However, most Americans enjoy their blancos mixed up with lime and orange liquor in a margarita. Margaritas, we learned, have an elusive past, and no one has been able to claim their invention with authority. They follow the framework of a New Orleans Sour with two parts base spirit, one part base sour, and one part base sweet. Pretty hard to mess up. Zolo has a great margarita list, by the way, and I sipped on a “Gold Coin” when I needed a little sweet interlude between tastings. I would be remiss not to mention the comida that accompanied the tequila. The “small” plates constituted an early dinner and complemented the tequila nicely, although we weren’t instructed to taste the tequila as it related to the food. We started with a Roasted Acorn Squash and Cascabel Chile Bisque followed by Pan Seared Chicken Thigh (served atop heirloom beans of varying shapes and sizes) with tequila barbecue sauce, and dessert was a Molten Chocolate Cake with tequila-tangerine reduction (worthy of finger-licking). That dessert–it went well with the añejo. Chef Justin Goerich visited us in the party room with an introduction of each course. If you’re interested in taking the tequila out of the margarita and getting to know it on its own, belly up to the bar at Zolo. The bartenders can pour a flight to your fancy: one of each kind of tequila from a single distiller like we did at the tasting, or you could swish three different reposados. However you do it, take your time–it’s the Mexican way–and especially if the snow is piling up outside.